The LTTE is a ruthless terrorists organization that loved bloodbath and were motivated to create mayhem in the country. Here are major LTTE attacks, suicide blows and massacres that targeted innocent civilians, politicians and Security Forces. November 30, 1984 - The Kent and Dollar Farm massacres was one of the earliest massacres of civilians carried out by the LTTE. The massacres took place in two tiny farming villages in the Mullaitivu district. At Dollar farm, 33 Sinhalese civilians were murdered and several others were injured in the shooting carried out by the LTTE cadres. 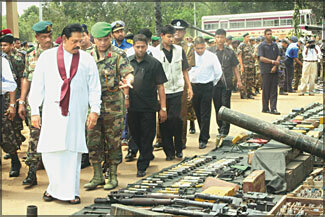 On the same day at Kent farm, another 29 Sinhalese civilians were massacred, thus increasing the total death toll to 62. Among the civilian casualties were men, women and children. May 14, 1985 - The Anuradhapura massacre in which LTTE cadres massacred 146 Sinhalese civilians. As the LTTE cadres entered the main bus station, they opened fire indiscriminately with automatic weapons killing and wounding many civilians who were waiting for buses. LTTE cadres then drove to the Buddhist Sri Maha Bodhi shrine and gunned down, monks and civilians as they engaged in the religious activities inside the Buddhist shrine. June 2, 1987 - The Aranthalawa massacre was the massacre of 33 Buddhist monks, most of them young novice monks and four civilians by the LTTE cadres in the Ampara district of Eastern Sri Lanka. August 4, 1990 - The Kattankudi mosque massacre was the killing of over 147 Muslim men and boys in a mosque in Kattankudi by LTTE cadres. It took place when around 30 terrorists raided four mosques in the town of Kattankudi, where over 300 people were prostrate in Isha prayers. March 2, 1991 - Deputy Defence Minister Ranjan Wijeratne and 18 persons were killed by an LTTE suicide bomber at Havelock Road in Colombo. May 21, 1991 - Former Indian Prime Minister Rajiv Gandhi and 18 persons were killed by a female suicide bomber in the town of Sriperumbudur, approximately 30 miles from Chennai, Capital of the Southern State of Tamil Nadu. June 21, 1991 - At least 21 people were killed and more than 175 others sustain injuries as a suicide bomber drove a truck laden with explosives into the Joint Operations Command Office at Flower Road, Colombo. November 16, 1991 - Commander of the Sri Lankan Navy, Vice Admiral W.W.E.C. Fernando and four Navy personnel were killed by a motorcycle-borne suicide bomber at Galle Face in Colombo. May 1, 1993 - A suicide bomber, later identified as Babu, killed President Ranasinghe Premadasa and 23 persons during a May Day rally at the Armour Street Junction in Colombo. October 24, 1994 - Leader of the Opposition and United National Party candidate for the Presidential Elections Gamini Dissanayake and 58 persons were killed by a female suicide bomber at Thotalaga (Grandpass) Junction in Colombo. August 7, 1995 - A male suicide bomber set off a cartload of explosives at Independence Square in Colombo killing 22 people and injuring more than 40 others. November 3, 1995 - A suicide unit intruded into an oil storage depot in Colombo and destroyed 14 storage tanks causing $61 million in damage. They also killed 23 soldiers and two civilians. May 25, 1995 - The Kallarawa massacre, LTTE cadres massacred 42 Sinhalese men, women and children in Kallarawa. All the remaining civilian survivors fled the village after this incident leading to its depopulation. January 31, 1996 - A suicide bomber detonates a truck loaded with more than 100 kilograms of explosives in front of the Central Bank at Janadhipathi Mawatha in Colombo killing 91 people and wounding at least 1,400 others. July 4, 1996 - At least 20 people, including Jaffna Military Commander Brig. Ananda Hamangoda, were killed and approximately 60 others sustained injuries when a female suicide bomber detonated explosives strapped to her waist as a Minister's motorcade stopped on the Stanley Road in Jaffna town. The Tigers' target, Housing and Construction Minister Nimal Siripala de Silva, escaped with minor injuries. July 25, 1996 - The Dehiwala train bombing resulted in 64 civilian deaths and wounding 400 others. The attack was carried out by the LTTE operatives placing suitcase bombs in four carriages on a commuter train. The simultaneous explosion of these bombs resulted in a large number of casualties. The technique of simultaneously exploding multiple bombs in several carriages was used for the first time in this attack. December 17, 1996 - A Deputy Police Commander was killed when a motorcycle laden with explosives is blown up by a male suicide bomber at a Police unit in Amparai. October 15, 1997 - Suicide bombers detonate a truck packed with a large quantity of explosives in the parking lot at Galadari Hotel close to the World Trade Center in Colombo killing 18 persons and injuring at least 110 others. January 25, 1998 - 16 persons were killed as Sri Lanka's holiest Buddhist shrine, Sri Dalada Maligawa, Temple of the Tooth Relic, in Kandy town was attacked by a group of suicide bombers causing extensive damages to its buildings, a cultural heritage site recognised by the UNESCO. February 23, 1998 - In a suicide attack on the Point Pedro coast in northern Sri Lanka, eight boats laden with explosives and driven by suicide bombers crashed into two Navy ships. At least 51 troops and 28 civilians were killed in this attack. March 5, 1998 - 36 civilians and two Police personnel were killed while 270 civilians sustain injuries when a mini-bus, filled with explosives, was blown up by a suicide bomber near the Maradana Police Station in Colombo. May 14, 1998 - Brigadier Larry Wijeyaratne, one of the Sri Lankan Army's top commanders was killed in Jaffna by a woman suicide bomber wearing an abdominal belt bomb. September 11, 1998 - Mayor of Jaffna, Ponnuyhurai Sivapalan, and 11 persons were killed and 12 people were wounded when a suicide bomber detonated a bomb strapped to his body at the Municipal Council building in Jaffna. May 29, 1999 - A cycle borne teenage suicide bomber kills Muthulingam Ganeshkumar alias Razeek, leader of an anti-LTTE vigilante group called the "Razeek Group" on the Trincomalee road in Batticaloa. Along with Razeek, his bodyguard Chandran Jeyakumar, two civilians and the suicide bomber were killed and eight others were wounded. July 29, 1999 - Moderate Tamil politician Dr. Neelan Thiruchelvam, a Member of Parliament representing the Tamil United Liberation Front, and two more persons were killed by a suicide bomber at the Kynsly Road, Rosmead Place Junction in Borella, Colombo. August 9, 1999 - In the first suicide bombing within an army camp, a male suicide bomber enters the Vakarai camp on the pretext of collecting weekly food relief and detonates a bomb strapped to his body killing Major T. G. J. B. Karunanayake, the Second in Command of an Infantry Battalion. Another Major, identified as J. H. Karunadasa, and three soldiers were wounded in the attack. September 18, 1999 - The Gongala Massacre was a massacre that occurred in the small village of Gonagala, located in the Ampara District. Over 50 men, women and children were hacked to death in the middle of the night. According to survivors, there was a significant presence of female cadres among the 75 LTTE cadres who took part in the killings. December 18, 1999 - In a failed attempt by a female suicide bomber on the life of former President Chandrika Kumaratunga at an election meeting at the Town Hall in Colombo, 21 persons were killed and over 100 others sustained injuries. The former President is, however, injured in one eye due to shrapnel injuries. Among those killed were four police personnel, including Colombo's Deputy Inspector-General T.N. De Silva. At least three senior ministers and some foreign journalists, including a Japanese television crew, were among the injured. December 18, 1999 - A suicide bomber, detonates a bomb strapped to his body killing retired Major General Lakshman Chula Algama and 11 persons at a United National Party (UNP) election rally at Ja-Ela in Colombo. June 5, 1999 - Thirty four Naval personnel are killed as a suicide squad of the 'Sea Tigers' sinks a gunboat of the Sri Lankan Navy off Vadamarachchi coast in Jaffna peninsula. June 7, 1999 - A suicide bomber kills the Minister of Industrial Development, C. V. Gooneratne, and 24 civilians whilst he was in a procession organised to mark 'war heroes' day at Golumadama Junction, Ratmalana. September 15, 1999 - Seven people were killed and 28 others sustained injuries when a suicide bomber, on being detected, blew himself up in front of a busy hospital in Colombo. Health Minister Nimal Sripala de Silva had a narrow escape as he had passed through the site barely seven minutes before the blast. October 3, 1999 - National Unity Alliance Trincomalee District candidate M. L. Baithullah, a candidate for the October 10-parliamentary elections, and 20 persons, including four police personnel were killed and approximately 49 wounded when a suicide bomber attacked an election rally in Muttur town. July 24, 2001 - A group of at least 20 suicide squad cadres wearing military uniforms and carrying shoulder-launched anti-tank weapons, mortars, T-56 rifles and RPGs attacked the Air Force base in Katunayake and the Bandaranaike International Airport, on the outskirts of Colombo. Eight military aircraft, including Kifr jets, two Mi-17 helicopters, one MiG-27 fighter, three Chinese K-8 trainer aircraft and six Airbus passenger aircraft were destroyed in the attack. Bodies of 13 LTTE cadres were found subsequently, including two of those who had blasted themselves. Six soldiers and an airport engineer were killed. August 11, 2005 - Laksman Kadirgamar was assassinated by a sniper fire by the LTTE cadres at his residence in Longden Place, Colombo. April 25, 2005 - Army Commander Lt. General Sarath Fonseka was critically injured while at least eight persons were killed when a female suicide cadre of the LTTE, disguised as a pregnant woman, blew herself up in front of the military hospital inside the Colombo Army headquarters. Twenty seven persons were injured in the explosion. June 26,2005 - A suicide bomber killed the SLA Deputy Chief of Staff, Major General Parami Kulathunge, the third highest appointment in the SLA, and three others at Pannipitiya. Eight persons were wounded in the explosion. August 14, 2005 - At least seven persons, including four soldiers of the SLA, were killed and 17 others sustain injuries in a suicide attack carried out by the LTTE targeting Pakistan High Commissioner Bashir Wali Mohammad in Colombo. The envoy, returning from the Pakistan Independence day function at the mission, escapes unhurt though his vehicle suffered minor damage. November 9 2005 - The Navy personnel foil a major LTTE attack on the civilian passenger vessel 'Green Ocean I' with 300 Jaffna bound civilians from Trincomalee in the sea off Nagarkovil destroying a flotilla of Sea-Tiger boats, including three suicide boats. Over 40 sea Tigers believed to be killed in the incident. October 16, 2006 - Digampathana truck bombing. A suicide bombing was carried out by the LTTE a convoy of 15 military buses at Digampathana, near the Dambulla town and Habarana. The buses were carrying more than 200 sailors from Trincomalee who were going on leave. The bombing killed between 92 and 103 sailors and wounded more than 150 people, including over 100 sailors. The bombing also killed a number of civilians, including eight employees of the Sri Lankan military. December 1, 2006 - A suicide attack by the LTTE, targeting the Defence Secretary, Gotabhaya Rajapaksa, at Dharmapala Mawatha in Colombo injured seven army personnel and seven civilians. Two of the injured army personnel subsequently succumbed to their injuries. The suicide bomber rammed his three-wheeler into the convoy of the Defence Secretary. Gotabhaya Rajapaksa. February 3, 2008 - At least 12 persons were killed and around 100 injured, 10 of them critically, when an LTTE female suicide militant blew herself inside the Colombo Fort Railway Station. The bomber who apparently arrived at the railway station in a train blew herself opposite the station cafeteria on platform number three at 2.10 pm. The LTTE would have targeted Security Forces personnel who were returning to their bases after rehearsals at the Galle Face Green. April 6, 2008 - The Highway Minister and Chief Government Whip Jeyaraj Fernandopulle and 13 others were killed in a suicide attack carried out by the LTTE at a sporting event in the Weliweriya area in Gampaha district. Fernandopulle was about to inaugurate a marathon when a suspected LTTE suicide bomber disguised as a marathon runner blew himself up, killing the Minister and at least 11 others, including National Athletic coach Lakshman De Alwis and Olympic marathon runner and national record holder K.A. Karunaratna. 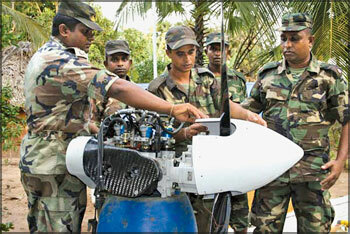 June 16, 2008 - A suspected LTTE suicide bomber on a motorbike blew himself up in front of a Police building in Vavuniya, killing 12 police personnel, including three female Police officers and wounding 23 others. The suicide bomber blew himself up in front of the SSP office complex in Vavuniya targeting the Police personnel leaving the SSP office for their duties at around 7.10 am. October 6, 2008 - 28 persons, including UNP NCPC Member Maj. General Janaka Perera and his wife; UNP Anuradhapura District Manager Dr. John Pulle who was also the former Chairman of the Rajarata Bus Company and his wife Dr. Mrs. John Pulle; UNP Legal Advisor Attorney-at-law A.C.S. Hameed; NCPC UNP Member Shantha Dissanayake and UNP Provincial Council candidate Subashi Charles were killed in a LTTE carried out suicide bomb attack inside the UNP office near the Old Bus Stand in Anuradhapura. More than 86 persons sustained injuries in the blast that occurred around 8.45am during a function held to declare open the new UNP office. March 10, 2009 - At least 14 people were killed and 46 others, including the Posts and Telecommunications Minister Mahinda Wijesekara, were wounded when a suspected LTTE suicide bomber blew himself up, targeting a procession celebrating Eid-e-Milad (Prophet Mohammed's birthday) in the Southern town of Akuressa in Matara district.